The main draw for this month’s QSF No.1 has been released, with Egypt’s former World No.3 Omar Mosaad and Germany’s Raphael Kandra seeded to meet in the final of the PSA World Tour Bronze tournament, which will take place between 10th and 14th November. The tournament will be held at the Khalifa International Tennis and Squash Complex and will see a high quality draw battle it out for a share of the $51,000 prize purse. Mosaad – who has never faced Kandra on the PSA Tour – is seeded on the same side of the draw as the likes of Spain’s former World No.5 Borja Golan [now withdrawn] Australia’s Cameron Pilley and England’s Chris Simpson. The Egyptian, along with the other top eight seeds, receives a bye into the second round and will face either Jamaica’s World No.81 Christopher Binnie or Welsh World No.50 Peter Creed for a place in the last eight. 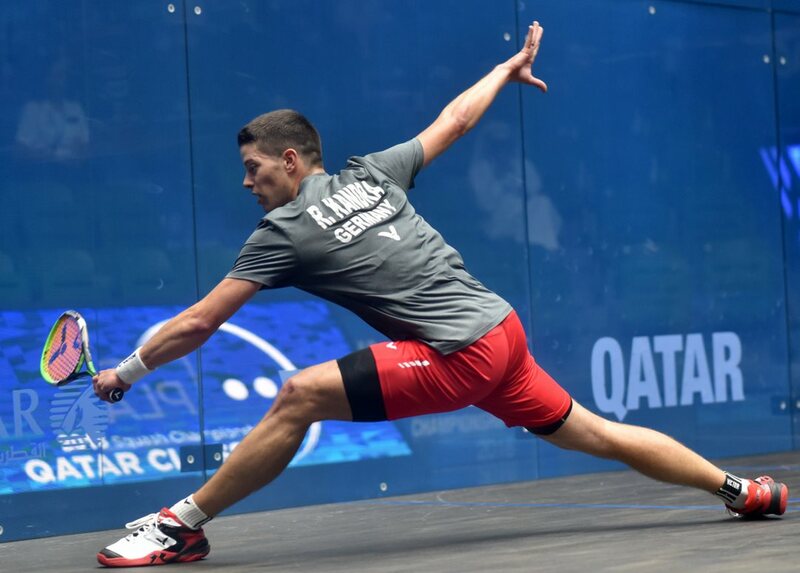 Germany’s Kandra, meanwhile, is seeded to meet England’s former World No.9 Daryl Selby in the semi-finals but will first have to navigate through a draw that also contains the likes of home favourite Qatar’s World No.23 Abdulla Al Tamimi and Scotland’s World No.32 Greg Lobban. Home interest comes in the form of Al Tamimi, who will face either Spain’s Iker Pajares or France’s Auguste Dussourd for a place in the quarter-finals. Wildcards Rashid Al-Harib and Hamad Al-Amri face England’s World No.53 Joshua Masters and Egypt’s World No.52 Mohamed Reda in the opening round.